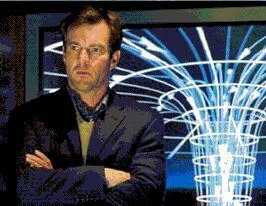 Cast: Dennis Quaid, Jake Gyllenhaal, Ian Holm, Emmy Rossum. Story: Sudden climate change results in an Ice Age rendering the northern hemisphere uninhabitable. 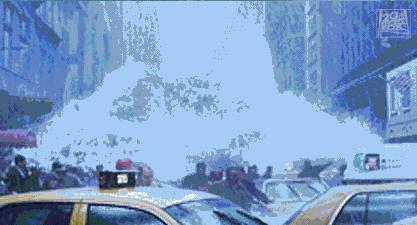 With a big tidal wave in Manhattan. Is it me or are trailers getting better? The last 10 movies I've seen have all been exactly as the trailer promised - The Day After Tomorrow is another prime example. The global climate changes suddenly, New York gets spectacularly taken out, then there's a boring ineffective "human interest" plotline of a kid getting trapped and saved as a result of a heroic effort by the climatologist father guy. Exactly what the trailer suggested. Make no bones about it, this is an effects-driven movie. The whole reason anyone will go to see it is to see Manhattan destroyed - not in a nasty way, just in a wow-that's-cool kind of way. This makes it somewhat surprising that the climax of the destruction happens fairly early on, probably at about the 45-minute mark. It's almost as if Mr Emmerich wanted to tell a human story, but couldn't get the funding without putting in a load of cataclysmic effects - but this can't be the case because the human story is so shallow and ordinary and probably took less time to write than to watch. So the point of the film must be the disaster bit ... so why finish it so early? The suspense is wound up very nicely from the beginning of the film, the story is set and we all settle down nicely, knowing exactly what's going to happen and looking forward to the city-trashing. Tornadoes begin to form and set about Los Angeles in a series of seriously entertaining scenes that set the effects at just the right level - mixing the effects into the action fabulously effectively. The tension and anticipation builds as the climatologists start realising the monumental scale of the devastation lying just hours ahead. And then - the tidal wave... this is perhaps a little over-amibitious in terms of effects, as it doesn't look quite real, but it's easily convincing enough to allow the viewer to revel in it. In fact I noticeably tingled as the wave breached the shore, and there are plenty of panoramic shots that work very nicely. The whole show up to this point has been very professional mindless disaster-movie fare. After the devastation, however, it all goes horribly wrong. Dennis Quaid sets out to rescue his son, walking from Philadelphia to New York in Arctic temperatures and ... oh it doesn't matter. It's utter tripe from here on, which is particularly irksome as it could have been made into a thought-provoking Armageddon story as Deep Impact attempted back in 1998. One of the particularly can-I-go-home-now moments occurs when the heroes run away from the rapidly dropping temperature and escape by closing the door. Outside the door, the temperature is minus 150, the inside of the door suddenly covers with ice, but it's OK, because it's shut. The nasty cold stuff that brought down three helicopters by freezing the fuel can't get us now. Come on guys, I wouldn't have bought that at the age of six. You can only get away with nonsense like this if there's enough eye-candy to distract the viewer, but all we get from here on is some Muppety wolves that look as real as Jordan. I half-expected "Wolves by Bob Carolgees" to appear on the credits. So it's very much a movie of two halves. The first hour is excellent and will hold anyone's attention, but after Manhattan succumbs to the elements, it not only runs out of steam, it turns off the kettle completely, unplugs it, boxes it up and sells it on eBay. Testosterone Satisfaction Rating: 2/5 Cracking disaster effects and whole continents dying. To enjoy this film you should: Spend the second half thinking about how good the first half was.